Activity Fairs in high school and college can be pretty intimidating on the outside, but they hold some of the best opportunities you'll maybe ever have. Choosing which clubs to join in high school is pretty simple. First think of what interests you. When I was in my freshman year of high school I thought I was going to be a graphic designer and I was good at math, so obviously I joined the art club and the math team. Over the course of my high school career I eventually became the creative editor of the yearbook, designing the entirety of my schools yearbook my senior year of high school. If you hate art, and math, think of what you like or may want to do in your life. Love handling money? Run for Treasurer. Like organizing events? Join the Spirit Committee. Join as many clubs as you think you can manage and make sure you enjoy them! Do not just join clubs to build your resume. It looks so much better on college applications to have 4 full years of participation in 1 or 2 clubs that you really enjoy than a couple of scattered months dedicated to 30 clubs. Before you go to the fair, look online. Most colleges have a posted list of all of the clubs they offer on campus. All you have to do is skim through the names. If something sounds like it will appeal to you write it down, and make a point to visit the list you create first when you go to the fair. It will definitely cut down on the stress you feel when you make a quasi list of the clubs you would consider joining. 2. Find out if there is a separate fair for academic clubs. During my club research I found out that my business school had a separate fair for just the clubs that the business school offered. Finding out if there is a smaller fair that includes one or more of the club(s) you like can seriously cut down on stress because you're not faced with hundred of clubs, rather you're faced with maybe 20-30. 3. Don't only focus of Major specific clubs. I am a marketing major, so I am joining the Marketing Club and the Women in Business Club; but I'm also considering joining the anthropology club. Why? I've always been fascinated with anthropology, so why not join a club dedicated to it? If something interests you but is outside of you major so not be afraid to consider it. It could lead you to a possible double major or minor, or if it's not academic, it could just be fun! College should be fun so don't forget to join clubs that can be that for you. 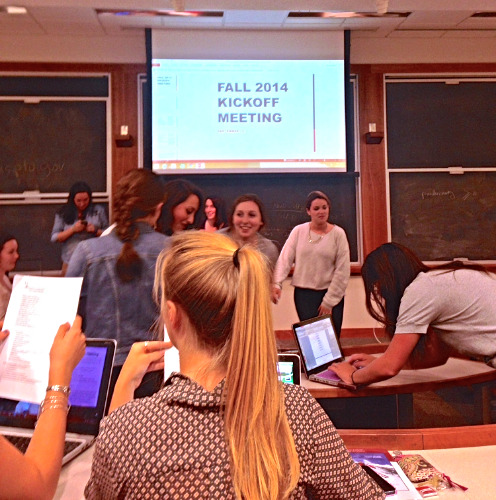 My first meeting with the Women in Business club here at Isenberg! That's my biggest piece of advice about both joining clubs, and college as a whole. So many big changes are going to happen in your life there, and you'll only enjoy it if you learn to be open and accept the change.